Obama and the Republicans: Why the president is finally getting tough. Why the president is finally getting tough. Barack Obama’s most cherished illusion during his first term was the possibility of cooperation with Republicans. Time and again, the president came to Congress bearing preemptive concessions—on his original economic stimulus package, his health care plan, and the 2011 debt-ceiling fight—only to have the door slammed in his face by an obstructionist GOP that viewed politics as a zero-sum game. Because the president has long seen himself as a conciliator and a bridge figure, he was unwilling to let go of his faith that if he only hewed to the path of moderation, his opponents would eventually have to meet him there. Obama’s efforts at compromise yielded him little. He won almost no Republican votes for any of his major initiatives. Being left hanging with his hand outstretched made him look weak and ineffectual during much of his first term, despite major legislative accomplishments. It disappointed his base, which would have preferred more stridency to match the GOP. The one advantage of Obama’s relentless reasonableness was that it rendered him immune to Republican charges of ruthlessness and extremism in the past election. Through the long, deep recession, the president’s approval rating never fell below the 40s. The Republican Congress bottomed out at 10 percent, near where it remains. Republicans are not revaluating their obdurate approach for reasons of ideology and individual self-interest (compromisers get “primaried” by well-funded true-believers). In recent weeks, however, we’ve seen the tentative emergence of a quite different second-term Obama: one shorn of his fantasies about compromise, contemptuous of his opponents, and almost eager to stand on principle. Obama II may be no more likely to get more legislation passed than Obama I. Politically, however, he is a bolder and more appealing figure: less the hostage, more the reluctant gunslinger of the classic Western. During the year-end fiscal-cliff negotiations, liberals feared the president would again crumple to economic blackmail by acceding to the extension of the Bush’s tax cuts, as he did in 2010, or caving on debt-ceiling concessions, as in 2011. Instead, it was Obama who stood his ground and House Speaker John Boehner who blinked. Bolstered by his new mandate, Obama stood firm and won the first tax agreement in two decades that is tilted in favor of the middle class rather than the wealthy. What Obama did not get was a grand bargain covering the pending “sequester” on spending or another increase on the debt ceiling shortly to expire. This time, however, the president seems resolved to handle the conflict differently. His cower has turned to swagger. “I will not have another debate with this Congress over whether or not they should pay the bills that they have already racked up through the laws that they passed,” he declared on New Year’s Day, laying down a marker. 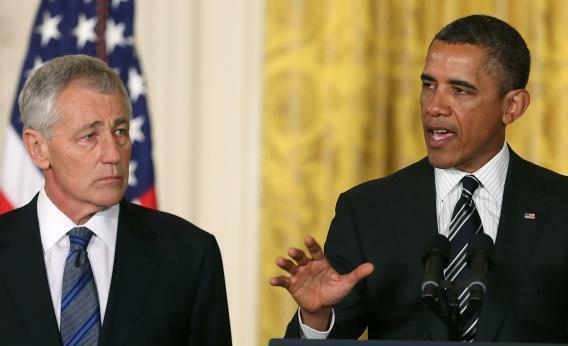 The president is similarly spoiling for a fight with his nomination of Chuck Hagel for secretary of defense. Conservative hawks who remember the former Republican senator’s opposition to the Iraq War consider him too reluctant to challenge Iran, insufficiently supportive of Israel, and excessively eager to cut military spending. At his announcement ceremony this week, Obama almost dared them to take on their former colleague, presenting Hagel as a wounded and decorated Vietnam veteran who “bears the scars of war.” It went without saying that he also bore the scars of the moderate Republican, a species hunted to near-extinction. On a range of other issues such as gun control, the president’s new tone suggests that he might prefer going it alone to beating his head against a wall of wing-nut opposition. This means either proceeding unilaterally with more limited executive orders or forcing the Republicans to stand up and be counted in opposition. There may be some political strategy here. The GOP continues to control the House largely because turnout in midterm elections is smaller, older, and whiter than in presidential years. Picking fights about social issues is probably the best way for Obama to turn out the Democratic base in 2014. But recapturing control of the House in his final two years remains a distant long shot. The real reason we’re seeing the emergence of a different Obama is simply the late-dawning realization that compromise is impossible with the enfeebled Boehner and his perfervid rank-and-file. Lacking a partner for peace, war has become the president’s only option. A slightly different version of this article appeared in the Financial Times.